Innovation as a springboard to economic growth and the need to remain competitive in the global market were prominent themes in Tuesday night's State of the Union speech. "We need to out-innovate, out-educate and out-build the rest of the world," President Obama said. But two recent reports suggest that there's great variation in global confidence levels, both in the U.S. and abroad. And the U.S. isn't exactly the home of the confident. A global survey of close to 6,000 senior business executives found confidence levels over economic performance to be higher in Latin America than any other part of the world, according to preliminary results of the 2011 Grant Thornton International Business Report, released earlier this month. 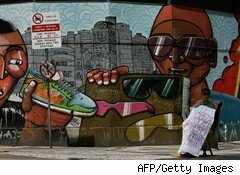 This is the first year Latin America has led the world on optimism, according to the findings, largely due to the economic recovery by Brazil, the region's largest economy (a mural in Sao Paulo pictured). Across Latin America, 78% of business executives are optimistic about their region's economic performance in 2011. Optimism in Europe is at 50%, while in North America it's just 44%. The Asia-Pacific region is the least optimistic, at 40%. "I suppose the biggest surprise was the decline in mainland China," says Peter Gutmann, a consultant with Experian, a financial business services company that provided economic background for the report. Business optimism in mainland China has taken a dramatic fall during the past 12 months. Only 53% of businesses are now optimistic about the outlook for the coming year, compared with 68% last year, according to the report. This represents one of the largest negative swings. Gutmann says the results were even more stark when compared to 2007, when Chinese optimism was 86%. He theorizes that the decline is due to worries about inflation, wage costs and trade tension as a result of the weak exchange rate. Conversely, Germany, "was way above anything they ever had," he says, with 82% of executives reporting optimism for 2011, compared to 57% in 2010, and even higher than during the boom period in the mid-2000s.. He attributes the dramatic increase to the positive impact of global trade and an increase in household spending. For the U.S., where optimism was came in at 40%, the results are mixed. "The big problem for the U.S., is the deficit," Gutmann says. "Americans need to take responsibility. They haven't cut spending." On the positive side, he says the country "is very clearly gaining momentum," even though deficit, employment and housing continue to be issues. Last year, optimism was measured at 50%, up from 24% in 2009. The full report, expected out later this year, is an annual survey of the views of senior executives in more than 7,400 privately held businesses in about 40 countries. A similar report released earlier this week by Nielsen found that 45% of North Americans expect the recession to last another year. Consumer confidence fell in 25 out of 52 countries in fourth-quarter 2010 as hope for a global economic recovery evaporated at the end of last year, according to the latest Nielsen Global Consumer Confidence Index, which tracks consumer confidence, major concerns and spending intentions among online consumers. The survey, which polled more than 29,000 Internet consumers in 52 countries in November 2010, found widespread concern for unemployment, job creation and rising food and utility costs. "Global consumers ended 2010 more pessimistic than at the start of last year. As the immediate economic and financial reality remained fragile and with the lack of positive indicators throughout 2010 consumers were given a harsh reality check that full recovery is still a long way off," Venkatesh Bala, chief economist at the Cambridge Group, a part of Nielsen, said in a statement. He called the lingering impact of the Great Recession further evidence of a new normal. "Global consumers -- especially in the West, are bracing themselves for another year of flat to sluggish growth in 2011," Bala said. Michael Czinkota, associate professor of marketing and international business at Georgetown University's McDonough School of Business, urges caution in relying too heavily on the results of both reports. Long-term data comparisons are needed to draw more robust conclusions, he says. Czinkota says there are also variations in how different cultures answer questions, so comparing results from one country to another is problematic. For example, Americans generally tend to be more optimistic in their outlook than people from some other countries. Also, answers can vary depending on who is surveyed. In the Nielsen report, respondents were exclusively Internet consumers. The results might vary if a more diverse sample of people were polled, says Czinkota, who's also a professor of international marketing at the University of Birmingham in the U.K. But despite concerns, such reports can be good "snapshots," he says. "They can help us understand direction and trends." Referring to President Obama's recent comments about global competition, Czinkota says: "What happens abroad does effect us. The reality is, governments rarely export. It's people who do." "Flexibility is key," he adds. "We cannot have our heads in the sand."